When it comes to fun in the Inland Valley, you have to mention Thunder The Dog. Thunder or "The Big Green Dog" as many call him. The official mascot of the Lake Elsinore Storm professional baseball, Thunder is the larger-than-life bright-green fur-covered pooch that always loves to be the life of the party. Thunder is the self-proclaimed California League Mascot of the Year, 19 seasons running, and 2010 & 2011 GameOps.com Mascot of the Year. A very special hound, Thunder is one of only a few members of the "Canis Thunderus" family. He is known for his ability to stand upright, walk on the tops of chairs, dance, drive quads, and generally just act a fool. He has a beautiful coat of green fur and wears one of the world's largest pair of shoes. As anyone can see he loves his food, just look at his belly. Thunder first debuted as the primary mascot for the Storm in 2001, taking the place of former Storm mascot Hamlet. and has been a crowd favorite in Lake Elsinore since. Hamlet still comes out for special occasions from time-to-time, but Thunder is the star of the show nowadays. You can find the lovable canine at all Storm home games in the stands and on the field sharing his antics with fans, players and umpires alike. When he's not at the Diamond you can find Thunder all around the Inland Empire spreading the Storm spirit as he makes over 300 community appearances every year. Some of Thunder's favorite appearances include birthday parties, holiday parades, grand openings and school assemblies. Thunder will go just about anywhere if bribed with food. One of his greatest achievements is spreading the word about staying positive everyday to the youth of the Inland Empire. Thunder has a message every day, "Get your rest, then do your best and be positive, the Thunder Way!" With his book "PAWSitivity With Thunder" and the Storm Reading for Rewards program, he has been able to share the importance of keeping a Positive Attitude With a Smile with close to 55,000 children in 15 cities and 66 elementary schools this year alone. Keep a look out for the big green dog; you never know where you'll see him next. If you want to see Thunder shake his belly at your next event, contact the Storm at 951-245-4487. Much Ruff from Thunder and Go Storm! To purchase Thunder merchandise (or "Thunderwear") click HERE! Mini Thunder, aka "Mini T", is Thunder's younger brother and puppy-sized shadow. He admires and constantly imitates his big bro at all times as he learns the ropes of being a professional mascot. Mini Thunder has his own mini quad and his own unique style. He can be seen at most Friday and Saturday games as well as certain promotional nights throughout the season. Jackpot, the score-keeping bunny rabbit, has been with the Storm since their inception in 1994 making him the longest employed mascot in Storm franchise history. Since the beginning, Jackpot always loved dancing. Have you ever seen him move!? He's got skills, and he'll show you. Go ahead take him on...if you dare. You can find Jackpot at Lake Elsinore Storm home games in random parts of the ballpark. He gets involved in promotions and even has his own intro during pre-game. But the best place to look for Jackpot is by the right field wall. Jackpot is the bunny in charge of the manual scoreboard every game. When the Storm score, Jackpot comes out from behind the wall and shows off his celebratory dance moves. Ace recently hung up the racing spikes after his final full season in 2017, but his legacy will live on. After years of being chased by too many dogs (*cough* Thunder *cough*), Ace decided to race baseball fans for six seasons. 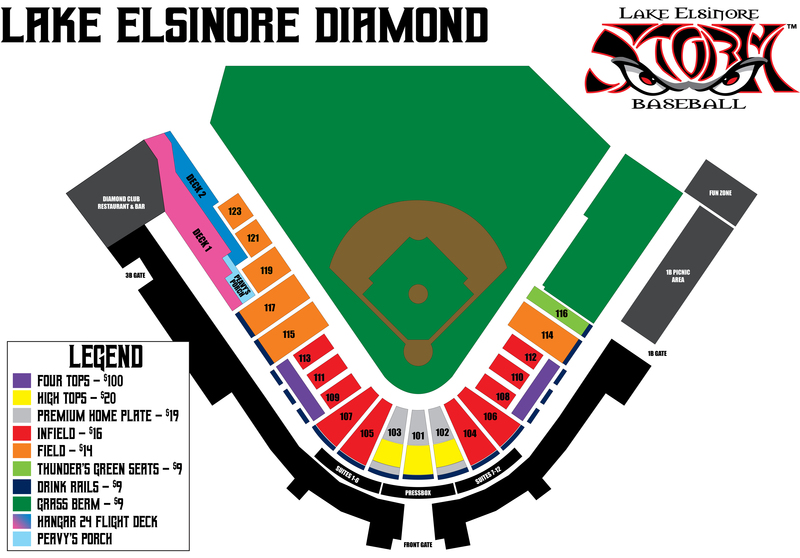 Named for his sponsor, The Lake Elsinore Hotel and Casino, Ace raced fans from foul pole to foul pole regularly during Storm home games at The Diamond. Each contestant had a chance to win $500 if they upset the heavily favored rodent in a race across the field. You can count the number of Ace's losses on one hand, but the number of victories is in the hundreds. The nutty and speedy squirrel began his career with the Lake Elsinore Storm in 2012 and gained notoriety after making his Major League debut at Petco Park in San Diego and earning a spot on SportsCenter's Top 10 plays of the day. The Giants had a 5-0 lead in the fourth inning over the Padres when Ace was called into action. After giving his unsuspecting opponent a huge lead, the "World's Fastest Squirrel" lived up to his name by rallying to win the race by about 10 meters. The Padres went on to score six runs that inning and win the game. Padres Manager Bud Black mentioned the Squirrel Race in a post-game interview as the turning point in the game for the team. After that, Ace became part of a national advertising campaign for ESPN. In the 2009 season the Gorilla had an ongoing feud with Inland Empire 66ers' Trayvon "Gorilla Killa" Robinson. The feud was never officially settled and may be reopened at any time. In 2011 the Grounds Crew Gorilla was honored at the Minor League Baseball Promotional Seminars with a "Golden Bobble Head" for the Best In-Game Promotion in Minor League Baseball.